Waste Services, Inc. (Nasdaq: WSII), a multi-regional, integrated solid waste services company, announced today that it has completed the refinancing of its term loan and revolving credit facilities with a new dual-currency credit facility totaling approximately US$300 million. The new credit facility consists of a US$39.9 million term loan, a CD$132.1 million term loan and US$139.6 million in a dual-currency revolving credit line. The term loans and revolver mature in 2013 and bear interest at LIBOR plus 3.5% on U.S. borrowings and a comparable rate on Canadian borrowings. The facility has been provided by a consortium of nine commercial banks with Barclays Capital and Banc of America Securities LLC serving as Joint Lead Arrangers and Joint Lead Bookrunners. Waste Services' President and Chief Executive Officer, David Sutherland-Yoest, applauded the new facility. "Barclays Capital and Bank of America have done an outstanding job during a turbulent period in the capital markets to provide us with an attractive new credit facility. The success of this offering speaks volumes about the relatively low risk nature of our assets and the recession resistant nature of the waste industry in general." Waste Services' Chief Financial Officer, Ed Johnson, commented that the new credit facility will almost immediately generate several significant benefits for the Company. "This new facility replaces our old revolving credit line which was approaching maturity in April 2009. It also has allowed us to put a substantial portion of our debt into Canada, helping us offset our Canadian profits where we are a cash tax payer. In addition, the new agreement is structured with a smaller term loan portion and a larger revolving portion, enabling us to use our cash more efficiently by giving us the flexibility to pay down debt with our excess cash without compromising our liquidity. In summary, this new facility improves our financing structure, significantly extends our debt maturities and provides us with usable dry powder for the opportunities that we expect will present themselves." 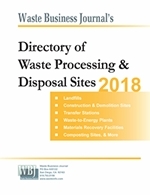 Waste Services, Inc., a Delaware corporation, is a multi-regional, integrated solid waste services company that provides collection, transfer, disposal and recycling services in the United States and Canada. Waste Services' operating strategy is disposal based, whereby the Company enters geographic markets with attractive growth or positive competitive characteristics by acquiring and developing landfill disposal capacity, then acquiring and developing waste collection and transfer operations. For more information about Waste Services, Inc., visit the company's website: www.wasteservicesinc.com. Information on the company's website does not form part of this press release. Certain matters discussed in this press release are "forward-looking statements" within the meaning of Section 27A of the Securities Act of 1933 and Section 21E of the Securities Exchange Act of 1934. These statements describe the company's future plans, objectives and goals. These forward-looking statements involve risks and uncertainties which could cause actual results to differ materially from the plans, objectives and goals set forth in this press release. Factors which could materially affect such forward-looking statements can be found in the company's periodic reports filed with the Securities and Exchange Commission, including risk factors detailed in the company's Form 10-K for the year ended December 31, 2007. Shareholders, potential investors and other readers are urged to consider these factors carefully in evaluating the forward-looking statements and are cautioned not to place undue reliance on such forward-looking statements. The forward-looking statements made in this press release are only made as of the date hereof and Waste Services undertakes no obligation to publicly update such forward-looking statements to reflect subsequent events or circumstances. Form 8-K for WASTE SERVICES, INC.
On October 8, 2008 Waste Services, Inc. refinanced its existing Credit Facilities with new Credit Facilities. The new Credit Facilities provide for a revolving credit facility of $139.6 million, of which $124.8 million is available in either the United States or Canada and C$16.3 million of which is available in Canada. The new Credit Facilities also provide for a term loan facility of $39.9 million in the United States and a term loan facility of C$132.2 million in Canada. The revolver commitments terminate on October 8, 2013 and the term loan facilities mature in specified quarterly installments beginning December 31, 2008 through October 8, 2013. The new Credit Facilities bear interest based upon a spread over base rate, Eurodollar loans or Bankers Acceptance loans, as defined, at the company's option in the applicable lending jurisdiction. On a weighted average basis, the rate currently approximates 7.17%. The new Credit Facilities are secured by all the assets of the company and its domestic and foreign subsidiaries, and are fully guaranteed by these subsidiaries. As the company has refinanced its old Credit Facilities prior to their scheduled maturity, in the fourth quarter of 2008 the company will incur an additional interest charge relative to its unamortized debt issue costs of $2.5 million. A copy of the press release announcing the refinancing is furnished as Exhibit 99.1 to this Form 8-K, and a copy of the credit agreement is furnished as Exhibit 99.2 to this Form 8-K. Section 3 - Securities and Trading Markets Item 3.03 Material Modification to Rights of Security Holders. 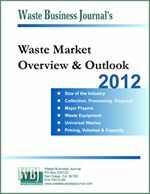 On October 7, 2008 Waste Services, Inc. issued a press release announcing it had successfully completed the consent solicitation relating to its 91/2% Senior Subordinated Notes due 2014. Consequently a supplemental indenture was executed implementing amendments that enable the company's Canadian subsidiaries, upon becoming guarantors of the notes, to incur indebtedness to the same extent as other guarantors of the notes. A copy of the press release is furnished as Exhibit 20.1 to this Form 8-K, and copies of the supplemental indentures are furnished as Exhibits 4.1 and 4.2 to this Form 8-K.